COULD A 25P CHARGE HELP THE UK RECYCLE 2.5 BILLION COFFEE CUPS A YEAR? IIB Insurance » News » Company News » COULD A 25P CHARGE HELP THE UK RECYCLE 2.5 BILLION COFFEE CUPS A YEAR? Roughly 500 used coffee cups are thrown away in the UK every minute. That’s 2.5 billion cups per year – or 30,000 tonnes of waste. Shockingly, just 1% is recycled. Although some local authorities do install recycling bins on streets alongside standard waste receptacles, it’s not just finding a place to dispose of our on-the-go cups that’s stopping us going green. The paper cups we’re used to sipping our lattes from are not just paper, but are lined with polyethylene. Currently, the UK has just three facilities which are able to split these paper and plastic components. As they cannot be sent to normal depots, simply putting your cup into a recycling bin will not necessarily see it broken down and reused. There are currently around 20,000 coffee shops in the UK, predicted to rise to 30,000 by 2025 – while the number of cups we send to landfill every year is expected to rise to around 3 billion by the same year. Labour MP Mary Creagh, chair of the environment audit committee, said coffee shop chains needed to do more to reduce the damaging environmental impact of this “massive increase”. “These coffee shops have a big responsibility under the producer responsibility obligations to provide proper recycling facilities and they are in breach of them”, she said. MPs are calling for a 25p charge on takeaway coffee. The levy would be invested in increasing the UK’s capacity to reprocess the cups, as well as discouraging the use of disposable cups. Ultimately, the committee proposes the ban of throwaway coffee cups if they are not all made recyclable by 2023. 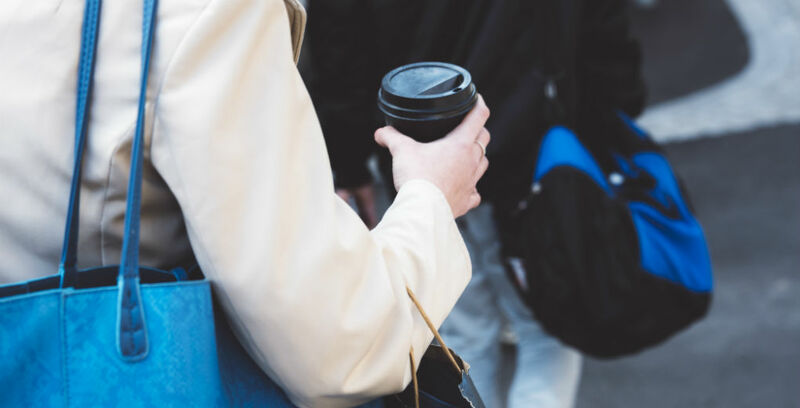 “Disposable coffee cups are an avoidable waste problem and if the UK cannot be confident of their future sustainability, the government should ban them,” Creagh said. The committee has also called for improved labelling to better educate customers, and suggests coffee chains should pay more towards recycling cups. Another option could be encouraging the use of reusable cups, such as travel mugs. Green party MP Caroline Lucas said the key was to encourage this. “Some coffee shops offer an incentive if people bring a reusable cup but uptake stands at only 2%”, she explained. Both Starbucks and Costa Coffee offer 25p off drinks when served in a customers’ own reusable cup, and collect used cups in specialist on-site bins for recycling – even from competitors.